The Nik Meller Collection of elegant premium grade optic crystal Awards are designed by International furniture designer and sculptor Nik Meller. As part of the Nik Meller Golf Award Series the Jupiter crystal award utilizes an elegant design with pristine detail. The cobalt blue crystal rectangular base, top, and rings highlight the clear crystal rectangular facade in a sophisticated way. 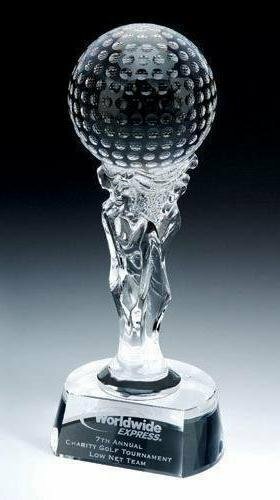 A clear crystal golf ball is adorned at the top of the award. This award is recognition of excellence and great performance. Available in three standard sizes. Custom sizes and multiple color combinations available upon request. Pure K9 premium optic crystal golf trophy with a crystal golf ball securely glued in the round opening. Available in three sizes.